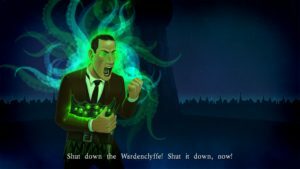 A buddy purchased Tesla vs. Lovecraft for me as a gift on Steam. As a fan of both historical figures I was immediately intrigued and it was just the kind of relatively mindless game play I could get into. 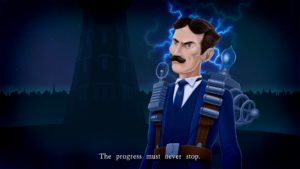 It’s a two-stick-style shooter where you, as Nikola Tesla, use a variety of technological inventions and weapons to push back hordes of Lovecraftian horrors summoned by H.P. Lovecraft himself with his book of eldritch magic. 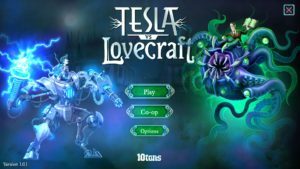 Apparently, Tesla is meddling with powers man was never meant to meddle with and Lovecraft is wielding magic man was never intended to wield to stop Tesla’s scientific progress to prevent a cataclysm (or a Cthulhu-ysm). The short of it is the game is fun, short, a bit unbalanced, a bit unpolished, and maybe a little too expensive ($15 currently on Steam). It can also be a bit repetitive, but no more so than say other games where you slaughter hordes of enemies, think the Diablo series. You can see from the world map image that there are at least a couple of dozen stages. Each stage starts off the same way with Tesla in his mech (of course he has a mech) for a limited time to help get you started. But the mech eventually explodes and you’re left with just Tesla, whatever perks he has, and a simple pistol. Perks are various abilities and upgrades Tesla gets as he levels up in the stage. These include things like extra damage, ricocheting bullets, regenerating health, and extra barrels. The early part of the stage is usually the make it or break it part of the gameplay. 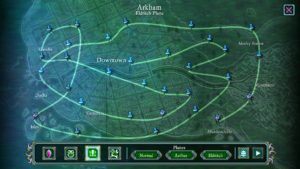 You’re relatively under-gunned and outclassed by the ever-increasing swarm of eldritch creatures spawning from various gates. You’ll spend that first couple of minutes frantically running away, shooting, and teleporting around the map to not get swallowed by the flood of spawns until you find a decent weapon. The weapons spawn randomly but are also appear to be level dependent. 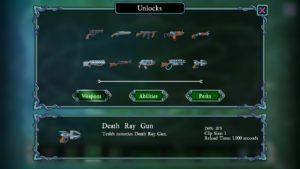 Early on, you can get a more powerful handgun or a shotgun, but later and with more levels you will get Gauss rifles and lightning guns. If you don’t get a good weapon early, especially in the more difficult levels, you’re probably going to die. Or even late in the stage and with many levels, you can imperil yourself by accidentally picking up a crappy weapon, going from a Gauss shotgun to a regular shot gun. There are other random power-ups you can collect in each stage in addition to weapons like pieces to rebuild your mech or limited-use super weapons. These are just nice little bonuses to help you survive. Or in the case of the mech, to quickly take down one of the bosses, which tend to be bigger versions of ordinary monsters with some special ability. 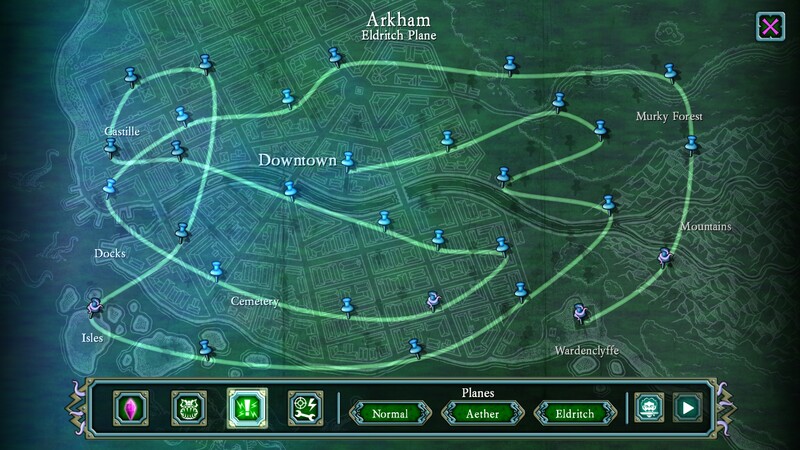 The game’s world map has three planes or difficulty settings. 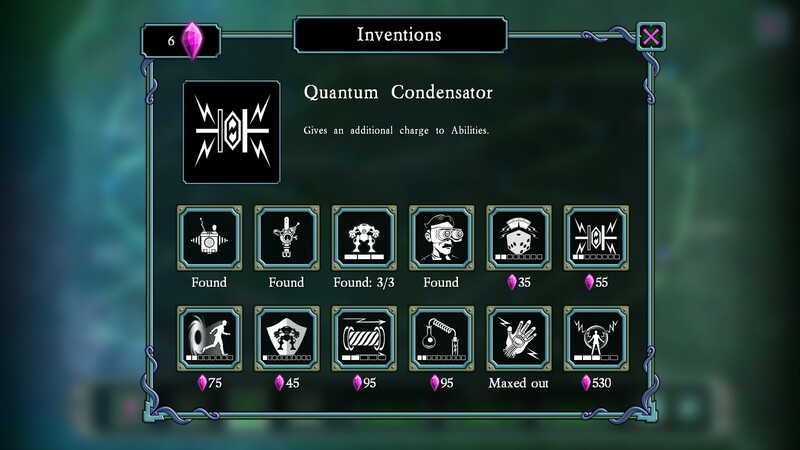 By the second one, the ether plane, ether crystals start to spawn in stages and you can use these to purchase various “inventions” that power Tesla up. 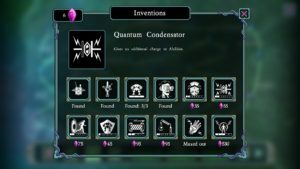 These inventions increase in cost as your improve them, but they are what help poor Tesla survive in the early going of the higher difficulty stages. Extra uses of teleport and starting with a super weapon are sometimes the only things that will keep you alive in narrow alleyways surrounded by monsters. There are also special power perks or items that rarely spawn. These all seem awesome at first, like infinite uses of teleport or super weapons, but some can get you killed in the late stages. 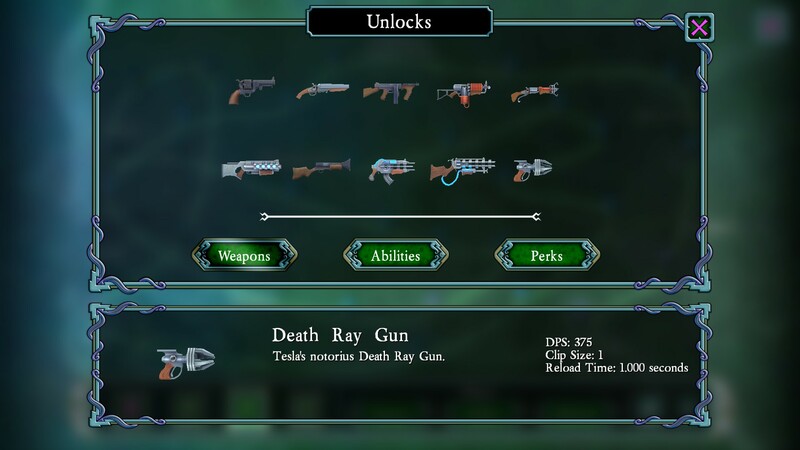 Picking up the death ray late in the game when you have a lot of perks can do more harm that good because the death ray doesn’t benefit from the perks you’ve collected until then nearly as much as some other weapons and has limited range. You’re usually far better off with a gauss shotgun or lighting ball gun near the end of a frantic stage than getting the death ray. When you kill monsters, you can experience points which gain levels. When you level up, you get to choose one of two random perks. 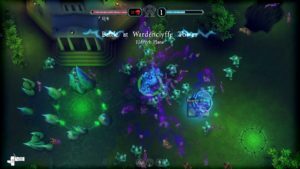 There’s some strategy as to what you should take at any given time, depending on the type of monsters trying to kill you, the weapon you have, etc. But if you just get unlucky, you’re first first few perks could be useless. I needed to replay certain stages several times just to get a good draw of perks and weapons to be able to survive long enough to kill monsters in mass and not be overwhelmed. There is an invention you can spend crystals on to reshuffle the pair of perks you get to choose from on a level up, at least. It’s worth noting that I really only played the single player campaign and didn’t try co-op. I also only gave the survival mode, but didn’t take to it. So, take this all with a grain of salt. The co-op coul dbe the best part of this game and I just don’t know because I didn’t try it. And ss silly as it sounds, I was most looking forward to the quirky campaign story and setting. And that’s where I was a little disappointed. The cut scenes are simple and the animation pretty underwhelming, akin to old flash videos. I do enjoy the art style however and the locations, like Wardenclyffe Tower and the Mountains of Madness. Those were a treat. The developers, 10tons Ltd., are patching and improving this game, which released back on Jan. 26 of this year. So, I expect many of my issues to be improved over time. But having gone through the campaign, I don’t have any real desire to return to it just to grind for crystals to unlock more inventions to compete in the survival mode for a high score. But I do recommend picking this up if you enjoy two-stick shooters or fast action games and catch it on a Steam sale.